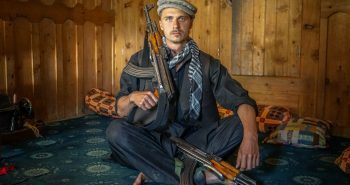 The sharp look of a war paint covered Ak-47 wielding tribesmen enters my gaze. The deep blast of horns fill the air as women beg to be whipped with tree branches. The dust rises as the hypnotically chanting tribal groups continuously jump up and down. It’s an absolute shock to the uninitiated, a scene from National Geographic documentaries that you watched as a child playing right before your eyes. It takes time to take it all in, but when you do you are filled with a whirlwind of emotions. Who knew such a place on earth, so beautifully primitive and culturally shocking still existed in this day and age. 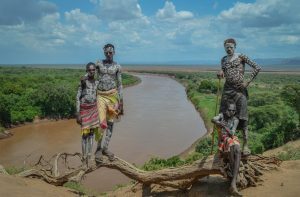 This is the Lower Omo Valley, in Southern Ethiopia. 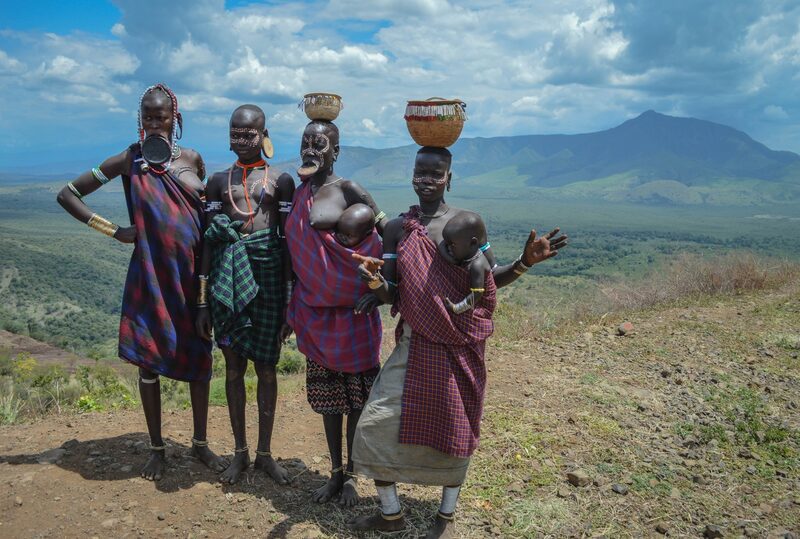 Is it easy to get to the Lower Omo Valley? This is a question I am often asked, and the answer is a matter of money. 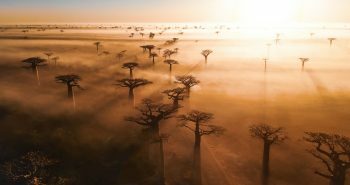 With a large budget, getting here is as easy as joining one of those safari packed overpriced exhibitions that usually leave you with a sour taste in your mouth. 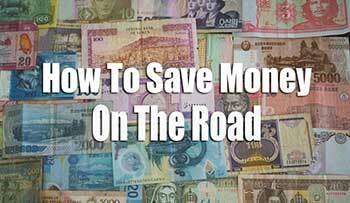 If you don’t happen to have a large sum of expendable cash to blow on a pricey tour, there does happen to be realistic alternatives for you! 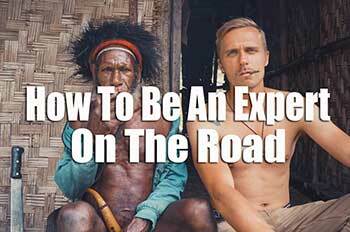 With this guide, not only the rich and famous can have a complete, tribal, immersive experience. Public Transport – From Addis Ababa you can catch one of the 12-hour public buses to Arba Minch from the Autobus Terra near the Merkato. 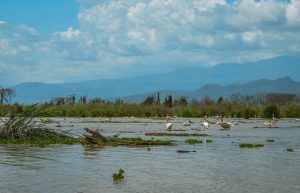 Once in Arba Minch, you can either spend a few days (which I highly recommend!) or hop on another connecting bus to Jinka from the Sikela bus station. 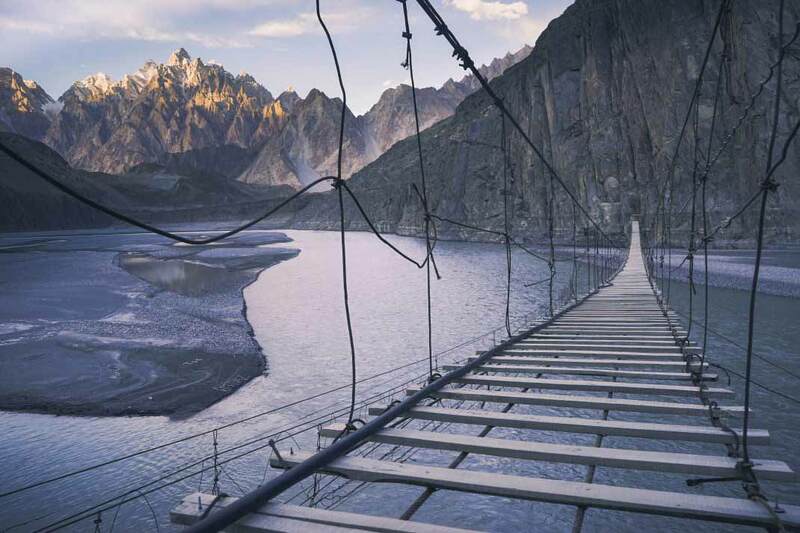 This part of the journey will take you around 6-9 hours, depending on stops and road conditions. 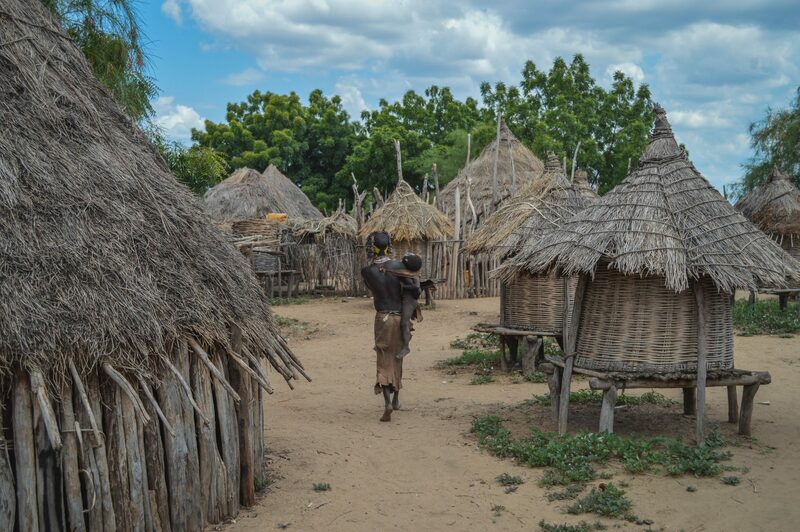 Once in Jinka, you can take minibuses to the major market villages Konso, Omorate and Turmi. 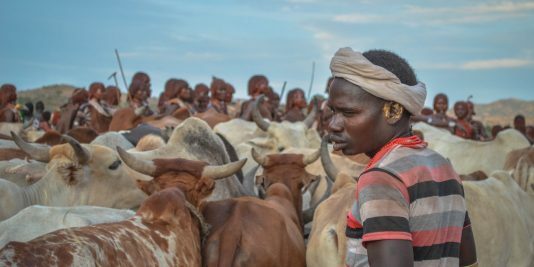 If you would like to visit some of the nomadic Mursi tribes or a remote bull jumping festival, then ask at any of the hotels or speak with one of the freelance guides that approach you, as the big guiding companies can be very overpriced. 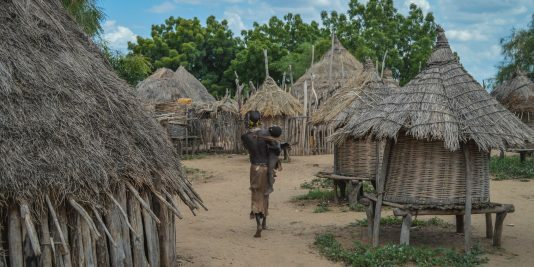 Hitch Hiking – I personally took public transport all the way to Jinka, but from Jinka I hitchhiked all over the Lower Omo. Finding rides is usually quite easy, but I did have to wait a few hours a couple times. Hitching to Jinka from Addis Ababa is possible, but there is plenty of more room for problems as well. 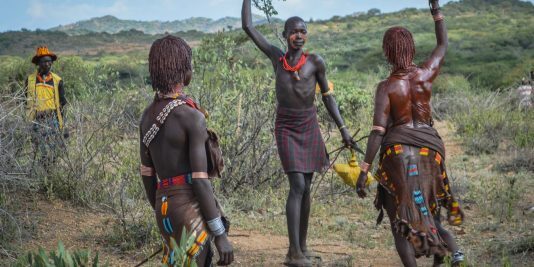 In the Lower Omo on the other hand, hitchhiking is a way of life, and your fellow hitchers tend to be tribal groups on their way to market. 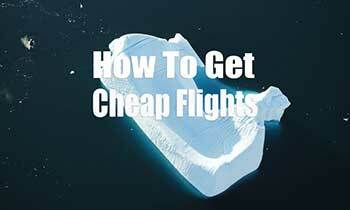 Tour – This is the most expensive option. 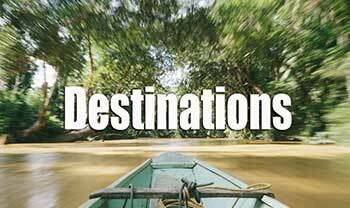 Tours can start from Addis Ababa, Arba Minch, and Jinka. The closer you are, the cheaper the tours can become, but also harder to arrange if you are alone. If you are dead set on taking a tour, I recommend you take the public bus to Jinka, and ask around there. 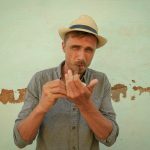 There are plenty of freelance guides in Jinka who would be more than happy to arrange a short tour for you. 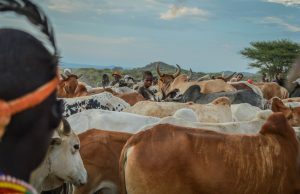 Arba Minch is a great half way point stopover on your way from Addis Ababa to the Lower Omo Valley. 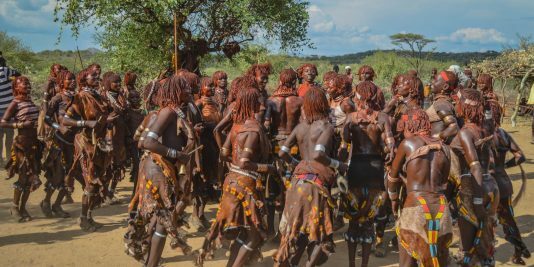 Arba Minch itself has very little to offer other than overpriced tourist agencies, but the sights surrounding Arba Minch are great! 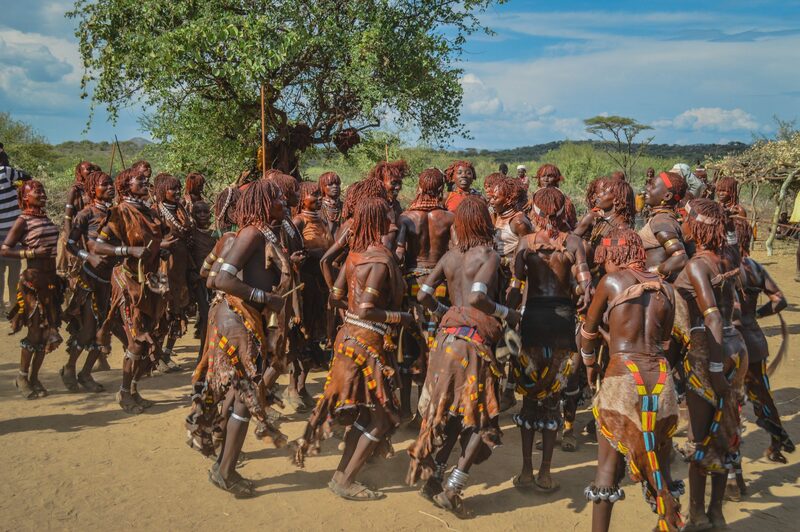 To visit Nechisar you will have to pick one of the local tour agencies in Arba Minch. 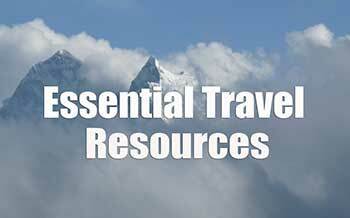 With a days’ notice, they can arrange the mandatory armed scout and guide to take you into the National Park. Our guide met us the day after we arrived at 8 am. We got into an old 4×4 and drove to the plains of Nechisar. Here we saw plenty of zebra and gazelle as well as an array of different kinds of baboons. 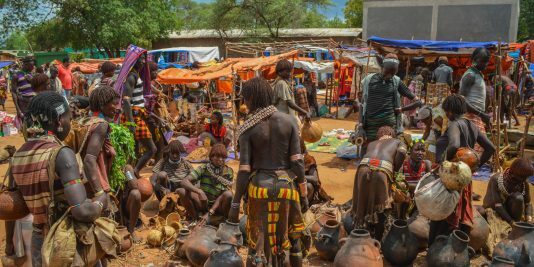 The highlight of Nechisar is the dubbed “Crocodile Market.” After visiting the Nechisar Plains, you will board a boat and head out on the lake. The locals know exactly where the crocodiles like to hang out in the midday sun. Once you arrive there, you can see why they call it the Crocodile Market. Tons of these guys are basking in the sun, swimming, and posing for pictures. I saw one croc about 5 meters long! Nearby, we also saw plenty of hippos. From Arba Minch you can board the bus heading up to Dorze in the Guge Mountains. The hour long journey goes straight uphill into a misty, forested region. Here you can see the village of Hayzo, with its two-story grass huts. It is mandatory to take a guide here as well, but it’s actually quite a pleasant experience. The guide keeps the children and souvenir sellers at bay while he shows you around the village. 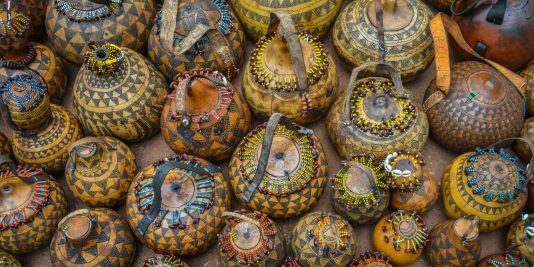 During one part of the tour, you learn about the arts and crafts locals do, and then you bake Kocho, a flat bread made from fermented sawdust. When the tour finished, we were invited into one of the local’s houses for coffee, local whiskey, and a khat chewing session that went on for hours! Khat – You will see Ethiopians everywhere chewing these green leaves. Khat, which is a mild euphoric narcotic, is chewed by the majority of people in the Horn of Africa. The effect is mild, but the chewer usually gets chatty at first before they begin to taper out. Often it is paired with coffee or alcohol. 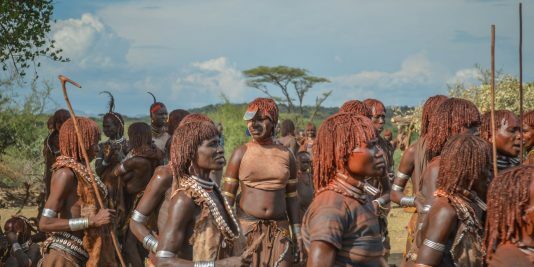 There are many tribes in the Lower Omo Valley, but these are the ones I visited. 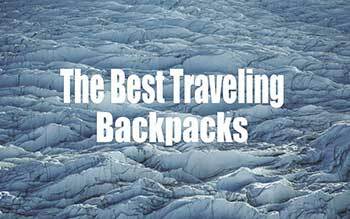 Most travelers come here for these tribes. 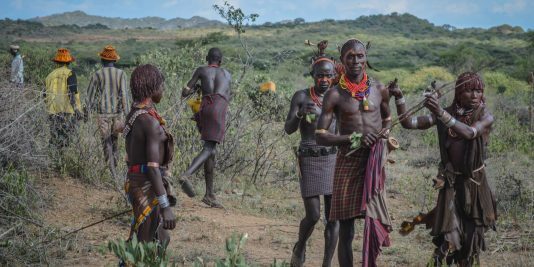 Some of the more remote tribes will take much more planning and money to visit. 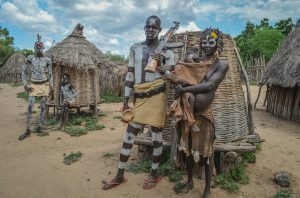 Ari Tribe – The Ari are the Lower Omo’s largest tribe. The Ari are very industrious blacksmiths, farmers, and potters. Most these days wear western clothing, but during special occasions, they don grass skirts and beads. Most of the Ari reside in and around Jinka. 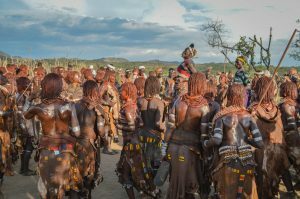 Hamar Tribe – Famous for their bull-jumping ceremonies, the Hamar are one of the largest tribes in the valley. They are easily recognizable from the red clay they put in their hair and the animal skins they wear. 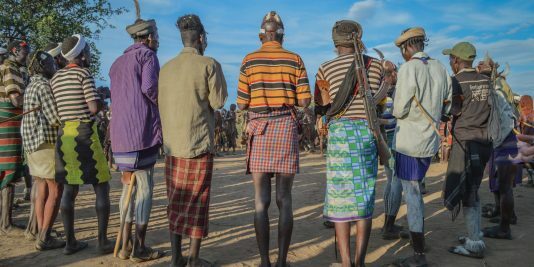 The men also wear a clay bun atop of their head, usually symbolizing a kill from a hunt or tribal warfare. 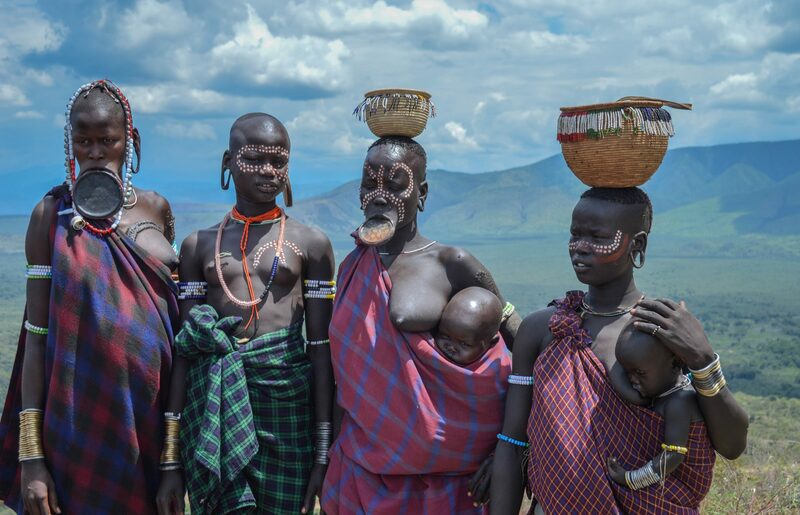 Most of the Hamar tribes reside near Turmi and Dimeka. Karo Tribe –East of Turmi are the Karo Tribes. Their numbers are quite small in comparison to the other tribes. The Karo cover themselves in white body paint, creating fantastic designs all over their bodies. 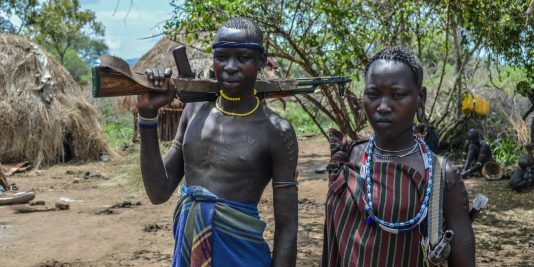 While you visit a Karo village, locals will grab their guns and proudly pose for photos (for a fee, of course!). 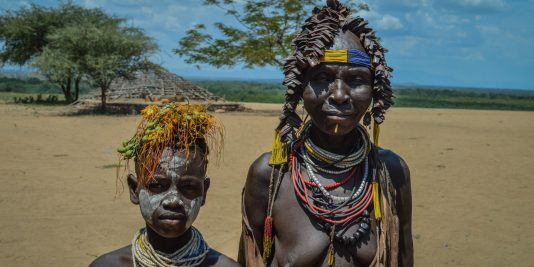 Mursi Tribe – The Mursi live a semi-nomadic life in Mago National Park, west of Jinka. 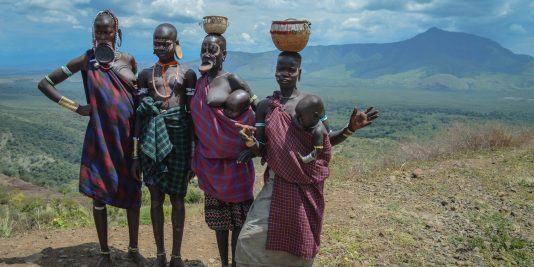 They are the most famous tribe, and probably the main reason most travelers want to visit the Lower Omo Valley. 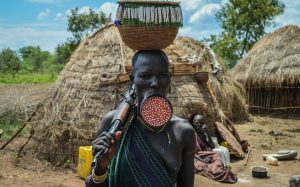 This is because of the lip disk that the Mursi wear. 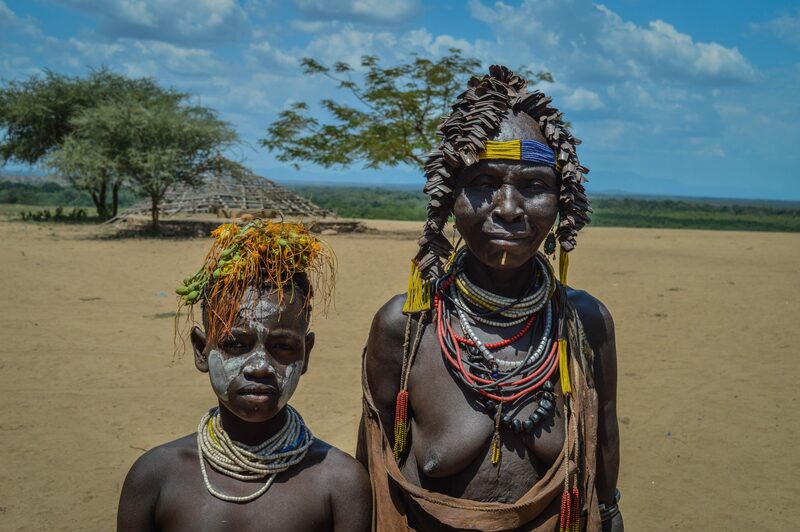 The Mursi are also one of the most aggressive tribes because of their popularity. 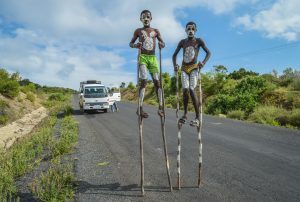 Regardless, they are a fascinating people and a highlight of any visit to Southern Ethiopia. I am a traveler, but I am also a passionate photographer as are most people in my industry. 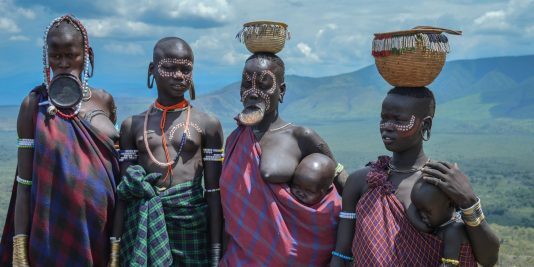 With my love of photography comes a desire to get great shots, but in the Lower Omo Valley, you must be conscious about this. 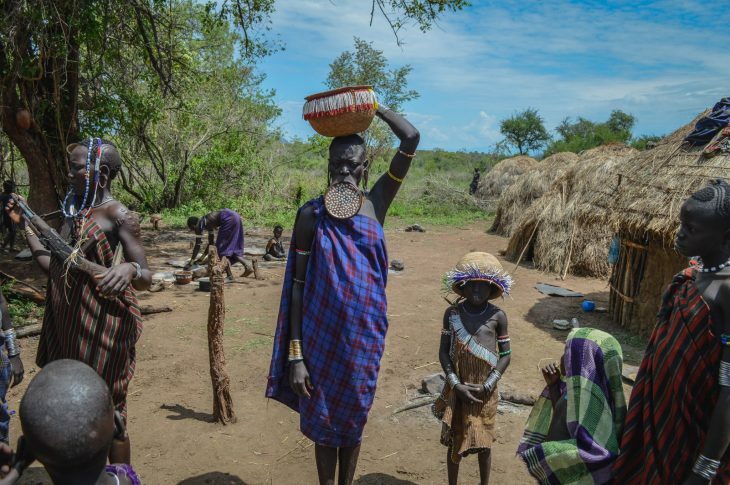 The people of the Lower Omo Valley have been getting visitors for quite some time now. When they see cameras they are not shocked, in fact they know exactly what they can get out of that mysterious little machine, and show very little respect to those carrying them. This unfortunate reality is because of snap-happy tourists who have little to no respect for the people here. If there happens to be a tour group when you are visiting one of these tribes, you just might get to witness how awful things can get. Tourists rush off their mini buses wielding their camera like a firearm and blast away. With zero appreciation of where they are and what incredible people they are visiting, they shove their cameras in the local’s faces and demand National Geographic quality photos! How can we avoid this and still get great photos? 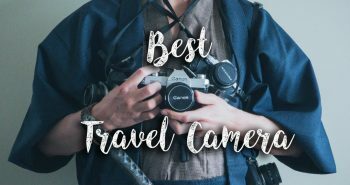 Some travelers will tell you not to take photos, others will say, “Who cares? Do what you want.” To break it all down is simple. 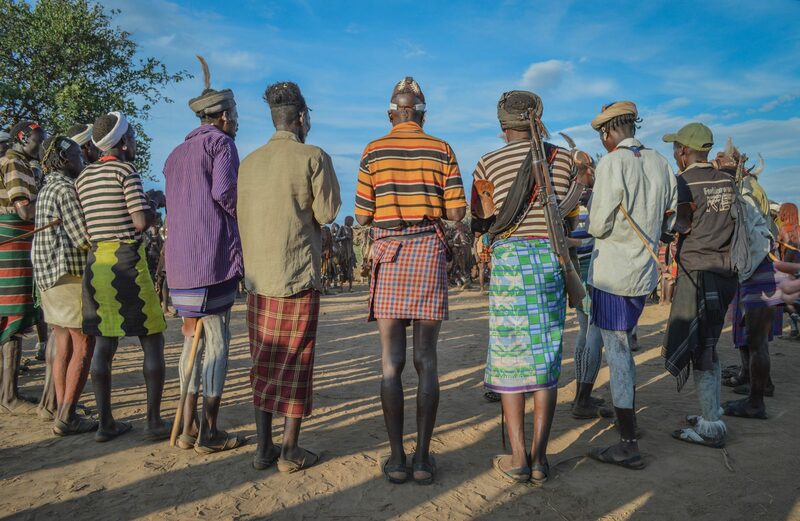 The tribes in the Lower Omo are people, so treat them like it. If you talk to them, interact with them, and treat them like human beings, they are much more inclined to let you photograph them. Not only will you get a great photograph, you will get a memory that will last you for your life. The moral of the story is to be sensitive with your camera. Do not endorse the horrible ways of those disrespectful tourists who care only about photos. 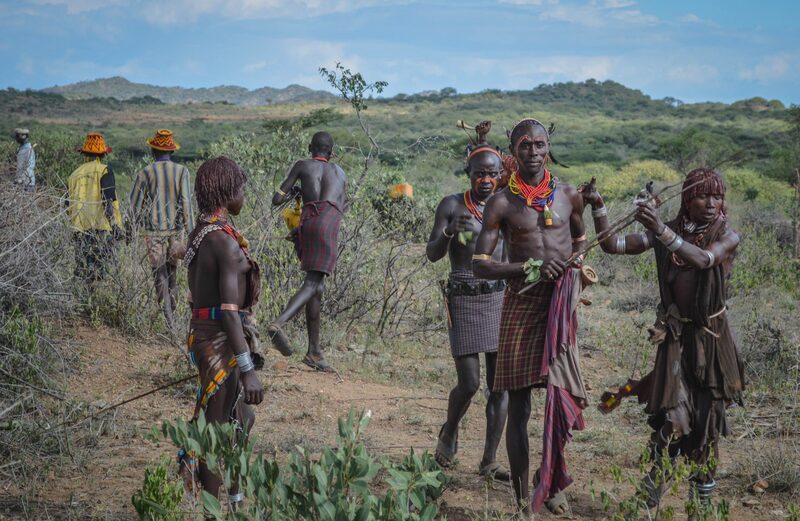 At the end of the day, we came here to experience the tribes, not photograph them. 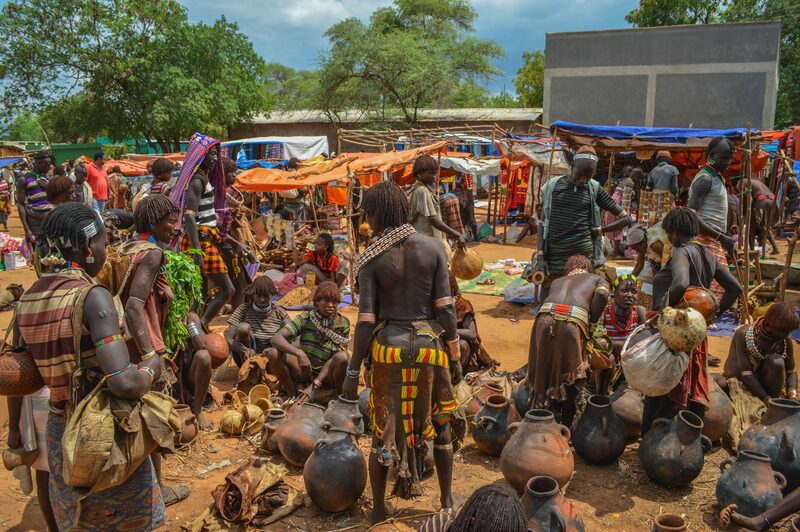 Visiting the markets in the Lower Omo Valley are a great way to see many tribes all at once. Jinka and Dimeka have the largest markets on Saturday, while Turmi is on Thursdays. 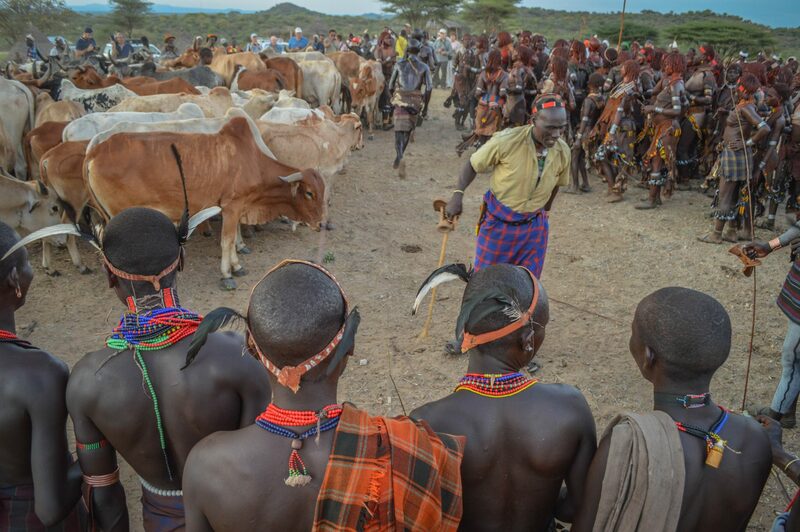 You do not need a guide to visit the markets so it can turn into a great way to interact with the different tribes. 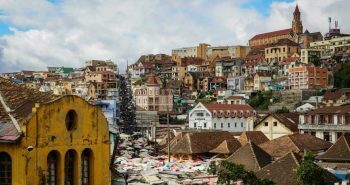 These days, a few of the tribes have caught on to the popularity the markets have with tourists. The Hamer especially are keen on selling products geared to tourists. This isn’t a bad thing in my opinion. Most of the products are handmade, some of them are even antiques. Each tribe makes their own unique items as well. I see it as a great opportunity for the tribes to make a bit of money, and provide tourists with a great insight to local arts and crafts. Be prepared to bargain hard! 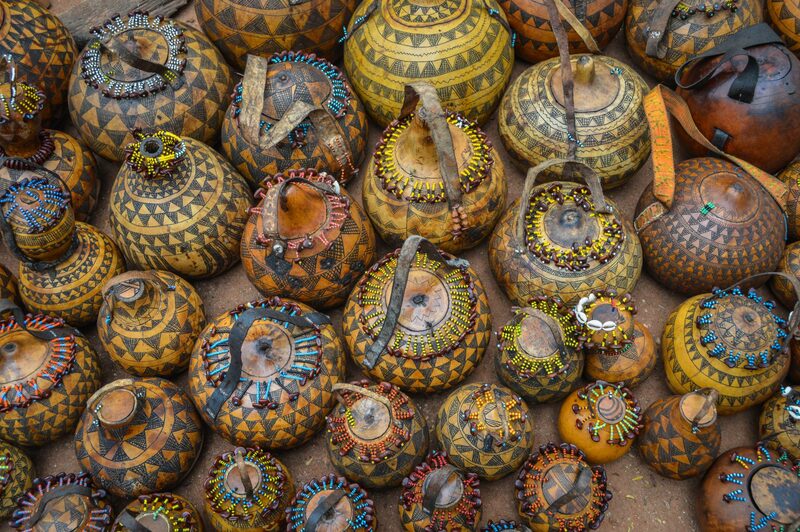 I visited all of the markets while in the Lower Omo Valley. Jinka’s market was a highlight as many Mursi came to buy supplies, many of whom were actually wearing lip disks. Some of the Mursi that I interacted with even showed me their scarification! The Dimeka market had the most crafts to purchase. Most of the crafts were Hamer made products. Some interesting buys were the leather marriage neck hoops, spears, beaded jewelry, and the odd old artifact. If you’re looking for a more off the beaten track market, then time your stay for Turmi’s Thursday market. There were only a handful of travelers at this one, and a lot fewer tourist vendors. While in Jinka I stayed at the Goh Hotel. Arriving here later in the evening gave me time to plan to visit the Mursi the following day. The receptionist recommended her friend from the Goh hotel who was a freelance guide and also happened to be half Mursi. For $75 US our guide arranged transport for me and three other travelers. The next day, we visited the Jinka Saturday market first. 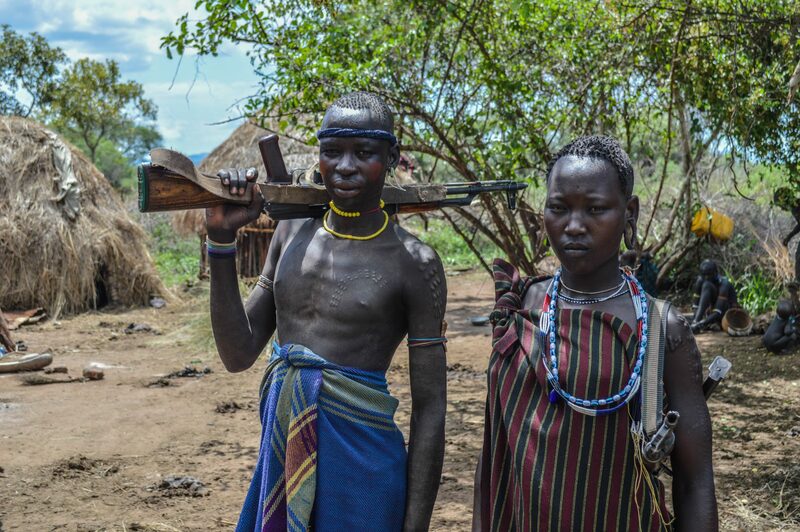 Here our guide introduced us to a few Mursi people who came into town to buy machetes. Communicating with the Mursi would normally just be with hand signals as English is not widely spoken here, but our guide spoke the local Mursi dialect so we could communicate freely with them. 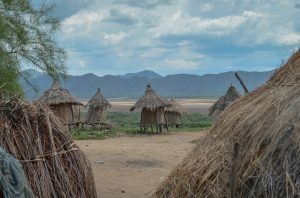 We left the market early so we could spend the rest of the day in Mago National park visiting several villages of the Mursi. We drove for several hours over bumpy, sandy roads. Several times, we had to get out of the van as it crossed over shallow rivers. Deep in the thick brush of the Lower Omo’s prickly Savanah, we came to a fence made from intertwined tree branches. A man wielding an Ak-47 approached us, and our guide calmly asked us to wait in the van as he negotiated a visit. The man brought the chief who agreed to let us stay for as long as we liked…. For $30 US of course. “This is how the laws work out here” our guide exclaimed to us! We paid the chief and he led us into the village. Upon entering the village, small children ran up to us trying to happily hold our hand while their other hand tried to dig around in our bags and pockets. The chief brought us to one of the small grass huts and our guide translated that if we wanted to take photos then to just pay the individual. At that point, the locals grabbed their most traditional looking gear. 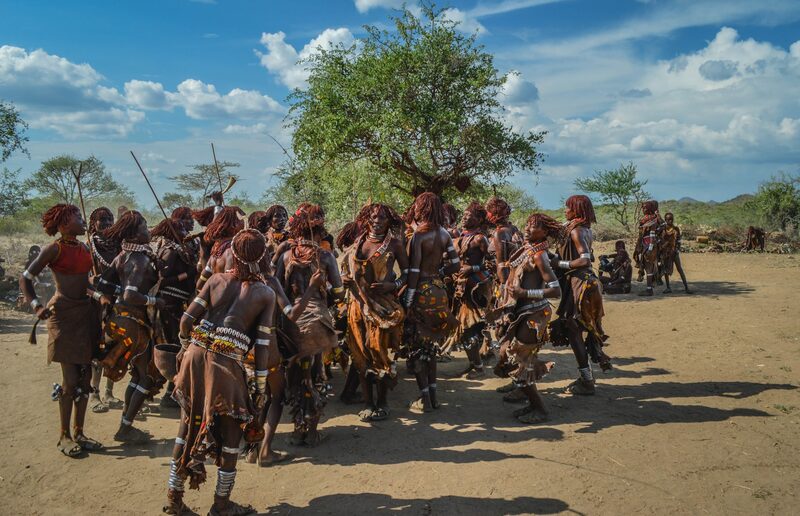 Some wore leathers while holding Ak-47’s while others had Hippo tusks on their head… or just a basket. After explaining that we wanted to take photos, but first we wanted to just talk and learn about their culture, the attitude changed very quickly. The women smiled and touched out hair, while the men let us play with their fully automatic rifles! Many of them were exhilarated at the opportunity to talk to us and ask us why we do some of the things we do. It was one of the best cultural experiences I have ever had! At the end, we said our goodbyes and they wanted to pose for photos… for free! They didn’t just pose, they were proud to do so. 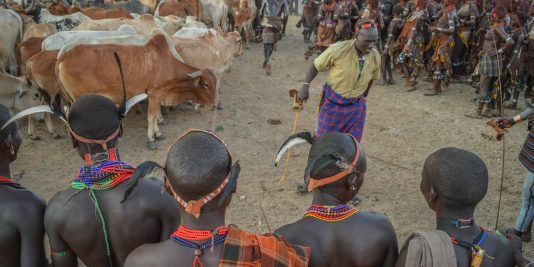 From Jinka, we hitchhiked down to Dimeka where we met a couple who were heading out to a bull jumping ceremony. After talking with them they agreed to take us there as well. We drove for several hours on roads made of red sand. The jeep struggled at many points, especially near the river crossing where we got stuck multiple times. 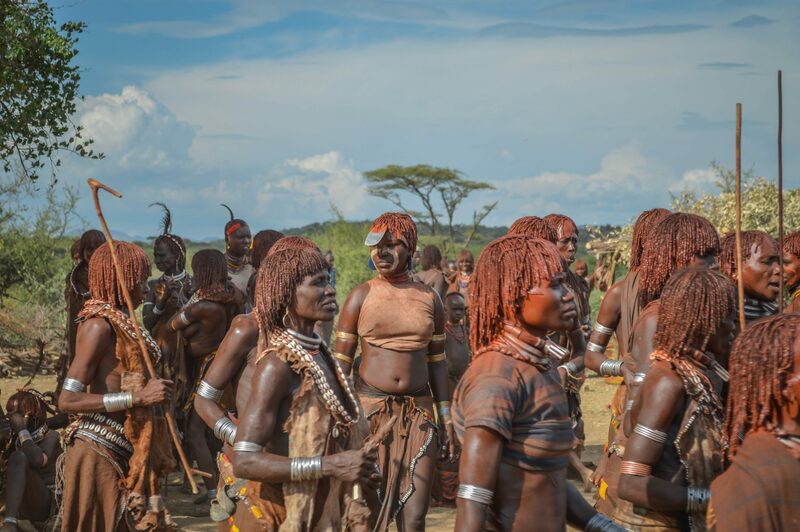 Nearing the ceremony, we followed the countless men donning animal skins and war paint on their faces. Many of them had a clay bun atop their head, and a long feather sticking out from it. Arriving at the village where the ceremony was held, we could hear the horns, singing, and drums of the Hamer in the distance. It was a swarm of painted people dancing, singing, and creating as much noise as possible. The locals here took very little notice to us, as they were much too focused on the celebrations. The air was thick with smoke from the recent hunting kills cooking in the huts. Suddenly all of the celebrations stopped. The men created a circle and began to dance with their firearms. The women then proceeded to line up and beg the men to whip them with a tree branch. It was a painful scene to watch as the tree branch dug deep gashes into the women’s backs. One by one the women begged for more of this. We learned that the scars on their backs from the event demonstrated their love for the boy who would be becoming a man! After the beatings, we all left the village and walked to a hill nearby. This is where the actual bull jumping would take place. 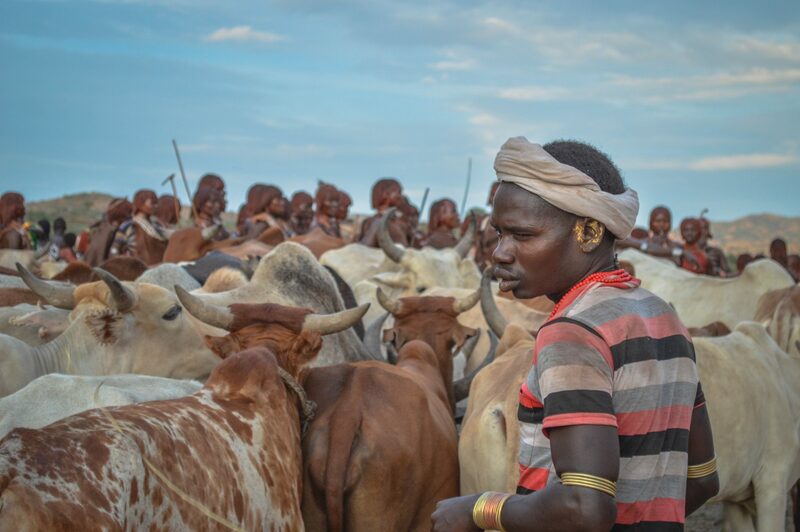 The young boy who was to become a man this day emerged and was ushered to pick the bulls he would jump. He selected around 20 bulls and they were put into a line. The naked boy then jumped up and ran across the backs successfully. If the boy is successful he will become a man, to fail is absolute humiliation! Everyone cheered as the boy successfully ran across all the bulls back without falling. The Boy Becomes a Man! The next day in Dimeka, we arranged a ride to one of the Karo Villages. The village was only a few hours north and the drive was very scenic. The Karo village was located on a cliffside overlooking a beautiful river valley. The houses were much more condensed here. The walls were built from mud and the roofs were pointed and made of grass. As with the other villages, we were approached by the appointed leader who we once again had to negotiate a price with to enter and stay in the village. 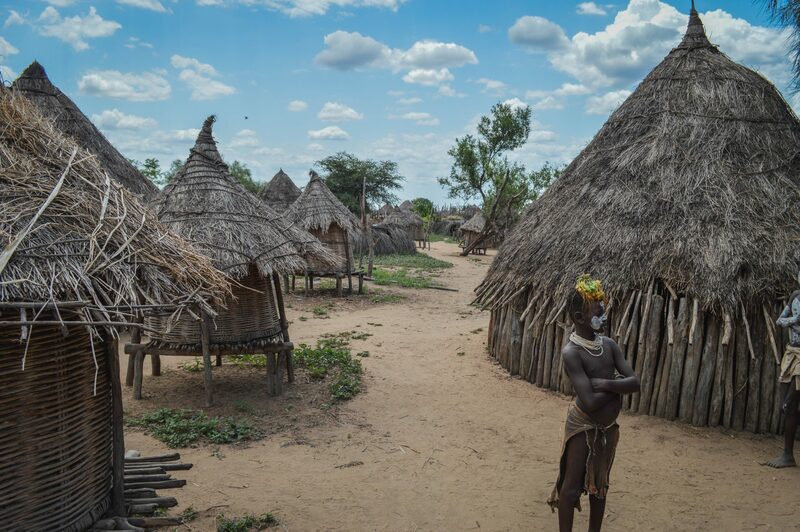 The Karo wanted significantly less money and were much more willing to show us into their homes. After they showed us a few of the local customs and their fully automatic weapons, they walked us over to their favorite hangout spot. This very spot provided one of the most stunning views we had in the entire Lower Omo Valley. Here they posed for photos and enjoyed a few laughs with us. 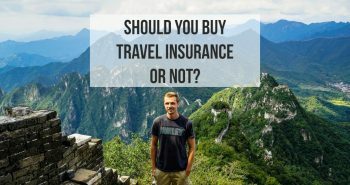 Tips: Travelling here on your own is not for those who enjoy comfort, be ready for hitchhiking, insects, bargaining, and less than appealing accommodation, but in exchange get ready for the trip of a lifetime! 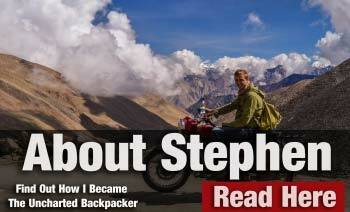 Thoroughly enjoyed this article and photos! Cannot wait to travel there myself in a few weeks, thank you! Great article, Matt. 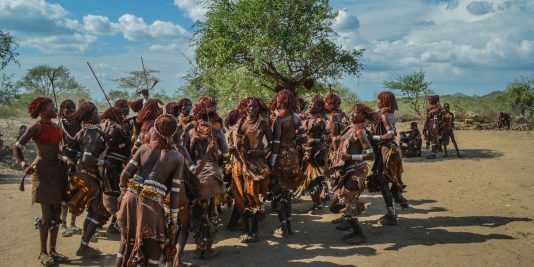 I’ve been reading several blogs about Omo and this is probably the most comprehensive article I’ve found! 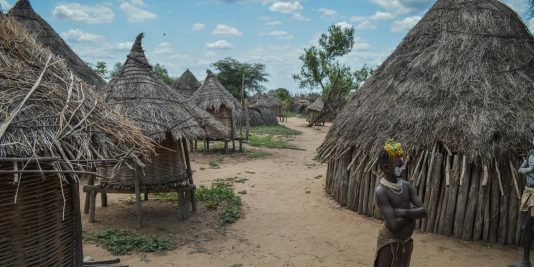 I was wondering about what time of the year you visited Omo, as the weather seems very nice in your pictures. 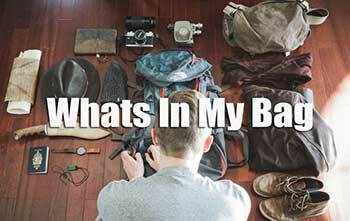 I’m considering a trip to Ethiopia myself around June next year and I hope Omo will be “backpackable” then. Thanks in advance!